Most factories and warehouses these days are trying to provide a clean, healthy and safe environment for their employees with the intention of maximizing their productivity. It’s an era where we just cannot overlook the health hazards that a polluted environment brings in. The primary focus should be on improving the air quality of the office space and surroundings to ensure that all the employees spend their valuable time in a healthy environment. Like most people believe or think, air quality is not just about the visible pollutants like smoke or smog. Volatile Organic Compounds popularly abbreviated as VOC is difficult to trace and are extremely dangerous to human health. If exposed to on a daily basis, it can compound to long-term health effects and can even hamper day to day activities. Hence it is important to monitor VOC and other harmful pollutants on a regular basis in order to ensure a productive industrial work environment. 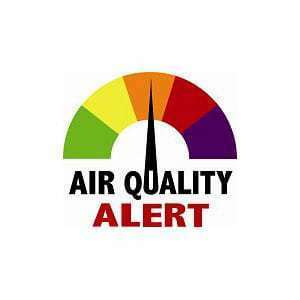 It is an alarming fact that the quality of the air has a large influence on the industrial worker productivity. Studies and researches conducted worldwide affirms the fact that worse the air quality, the productivity was directly proportional. Be it ozone levels at outdoor or particulate matter (PM) in indoors, both had a direct impact on the worker efficiency and productivity. Maintaining good indoor air quality should be a priority across industries or verticals and I am sure you also might have felt uneasy while working in an environment with high levels of particulate matter. Though PM concentration level increase is a concern outdoors as well, the effect is much worse indoors due to poor ventilations. The particulate matter compounds are generally undetectable to human eye but can have an adverse effect on the health when inhaled. Most modern buildings are centrally air conditioned and have generally a sealed environment. This lack of ventilation will allow the particulate matter to settle inside the space which may be initially unharmful but can be harmful if risen to alarming levels. In most of the countries, this is becoming a major concern across each industry and vertical. The productivity issue is more so evident in the factory shop floor where the workers move around a lot, sometimes in a very confined area or space. As a result, they are constantly exposed to the pollutant matters and thus hampering their productivity. Most companies still feel that anything related to air quality improvement would cost them a fortune and refrain themselves from implementing the same. Sometimes even at the expense of a slightly decreased productivity. But the reality is vastly different, studies suggest that the manufacturing companies that opted to implement methods to improve indoor air quality has saved close to $20 billion annually due to increase in productivity. The situation is somewhat similar, if not better for smaller industries as well. The primary aim of any company should be to curb the pollutants in any which way possible. But no matter how much you try to clean your indoors and even HVAC units, there would be a residual particulate matter that affects the air quality. Especially in a factory floor, where there would be work going on 24*7, it is extremely important to know the level of particulate matter at a given point of time. Proper ventilation is extremely important, and one must ensure that there should be a constant flow of air inside the premises. We believe that air quality monitoring technology can play a big part in improving the air quality of an indoor space. But for that, organisation must be aware of the particulate matter or VOC level at industrial premises. The earlier one gets informed about the same, the better. Wireless environment monitoring solutions can help you get important air quality data which in turn can aid in optimizing your workspace environment. To summarize, the greater the quality of air, greater is the workforce productivity. Activity Based Costing is widely used in the manufacturing industry. However, it comes with its fair share of criticism because it is difficult to correctly estimate the amount of resources required to perform a task efficiently. Two of the key performance indicators (KPI) in the manufacturing industry are MTBF (Mean Time Between Failures) and MTTR (Mean Time To Repair). MTBF is a performance metric that measures the time elapsed between when a failure occurs and the next time it happens. MTTR is the time spent to conduct repairs once a failure occurs. Both these KPI’s are calculated by dividing the total time taken respectively by the number of failures. While these are good indicators of performance, they are flawed. Failures cannot be foreseen as they are not uniform and can occur at any point of time. In the case of repairs, it may take longer for some than others. That is why these metrics lack real-life accuracy. Using condition monitoring solutions, it is possible to successfully obtain operational information from machines which are variable in nature. The actual operational times of the machines can be analysed and resources can be allocated accurately. Maintenance can be scheduled based on the number of hours used. This eliminates the need to estimate KPIs like Mean Time Between Failures and Mean Time To Repair by providing us actual figures of usage. No excess resources will need to be allocated . This will in turn improve operational efficiency and ultimately lead to a higher Return on Investment (ROI). Most of factories and warehouses employ technical staff to conduct periodic check and repairs to ensure the asset equipment are up and running all the time. Unexpected breakdowns can lead to loss in revenue, opportunity costs, unsatisfied customer etc. Using our IOT in maintenance solutions, your own technicians will be able to remotely monitor the fixed assets to help prevent breakdowns. Implementing a retrofit IOT solution with non invasive sensors and integrating data visualisation tools can help businesses to improve equipment uptime, track and trace of critical plant and machinery in factories, shipyards, airports, supply chain environment, warehouses etc, which otherwise takes many man hours of unproductive work. Anomaly detection solutions for industrial automation can help businesses improve the operational excellence by pro active maintenance, optimising spares inventory and reducing energy consumption of various heavy industry equipment. Call us at the following numbers to more on how IOT industrial automation sensors and IOT in maintenance management using anomaly detection solutions can help improve asset efficiency and reduce breakdowns. Industry 4.0 is reshaping the manufacturing space and in a shared economy model, connected objects and data visualisation tools help in improving efficiencies. Venue: Training Room T1C, Level 1, 9, Jurong Town Hall Road, Trade Association Hub, Singapore 609431.